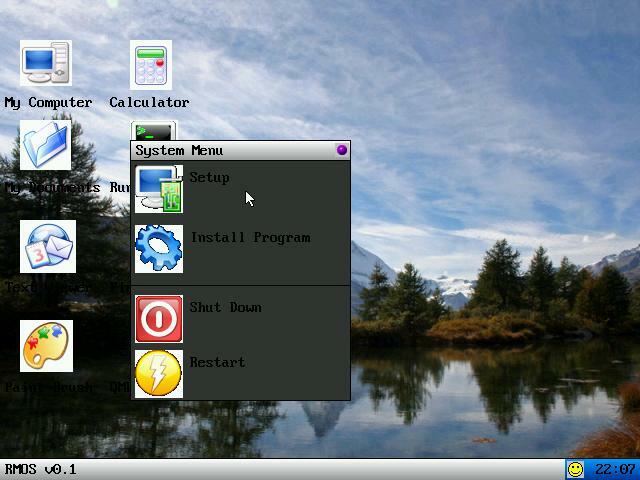 RMOS is an interesting GUI mainly for its use of KDE icons. There really isn't much that works as well as it should. There are a couple of apps that run but the System Menu, as seen in this screenshot, only allows me to "Shut Down." I can't do much of anything else. To access it, you must click the smiley in the system tray-like area. There are a couple of glitches here and there but if it were improved greatly (especially the all-black text), it would be a really neat GUI to use. There are 3 easter eggs in this thing.